Innovation Place is a Saskatchewan Crown corporation with technology parks on the university campuses in Saskatoon and Regina as well as a forest sector building in Prince Albert. Their mission is to support the growth and success of the province’s technology sector. Innovation Place operates 26 buildings with 185 tenants in three different cities. That’s a huge responsibility but also a tremendous opportunity to lead the way in building and maintaining environmentally-friendly buildings. Sustainability is not a special initiative at Innovation Place; it’s standard operating practice. “We own and operate the buildings and will be managing the space for a considerable length of time,” Gord explains, “so we need to consider minimizing operating cost, not simply the initial capital costs.” Let’s take a look at how they do it. Minimizing waste and maximizing efficiencies begins at the planning and design stage. Innovation Place has adopted an integrated design approach, which looks at the whole building as a single system. Carpet and ceiling tiles are installed throughout the shell of the new building before the internal walls go up. This minimizes cutting and waste as the tiles do not need to be cut to fit each individual space. This also results in savings on labour costs. The focus is on the overall lifecycle of the building. Carpet tiles are more expensive than broadloom, but money is saved in the long run because individual tiles can be replaced rather than having to replace the entire carpet. Minimizing waste begins in the planning process as they try to design leasehold spaces that will be compatible with more than one tenant’s needs (e.g. office size). During demolition, they try and salvage as much material as possible so that doors, ceilings, light fixtures, and other items can be reused. If there is surplus material, it is donated to Habitat for Humanity or a charitable organization. New buildings are designed to LEED standards to minimize the overall energy requirements. Heat pumps are effective in the shoulder seasons, while heat recovery systems recover most of the heat that is being exhausted out of the building in order to pre-warm air coming into the building. Thermal scans have been done on some of the older buildings to see where there is gross energy leakage. Operating schedules are closely monitored in order to lower set temperatures in the evenings or on weekends. In keeping with its mandate, Innovation Place tries to provide opportunities to use new technologies in the parks in order to help industry to build capacity. A small vertical wind turbine has been installed on a building in the Regina park in partnership with the University of Regina who will use it for research purposes. Innovation Place has just installed a solar array on the Atrium building in Saskatoon with net metering arrangements with the City of Saskatoon. Programmable, dimmable lighting systems have been installed in the two newest buildings in Saskatoon and Regina. The artificial lighting dims automatically when the natural light is high. Later in the day, when there is less natural light, it increases to a higher level. The lighting system has shown good success, particularly in one building, so Innovation Place will be looking at other places where it can be used. Dark sky lighting has been installed in most of the Regina park and has been installed as a test project along Innovation Boulevard in Saskatoon. Outdated fixtures will gradually be replaced with LED lights that have been designed to direct the light down where it’s needed rather than wasting energy by shooting it in all directions. Dark sky lighting is believed to benefit some wildlife that are adversely affected by light pollution. The parks are looking at turning outdoor lighting down when there are no people on the site, but they are having difficulty figuring out how to make it work while still maintaining safety. Water reduction strategies were an important part of the planning process for the LEED-certified buildings. Older buildings, such as the Galleria building, have also been switched to low-flow toilets and touch-free fixtures, which reduce the length of time the water flows. Outdoors, the focus is on drought-tolerant plants along with rainwater and moisture sensors to control when the water comes on. Gord says that the next big challenge is helping tenants understand the impact they have on energy reduction. This process has begun with the introduction of recycling and carpooling programs. The results of Innovation Place’s sustainability efforts are demonstrated by the awards they have received from industry. Almost all the client-occupied buildings have been certified by BOMA, the Canadian industry standard for green certification (established by the Building Owners and Managers Association of Canada Building Environmental Standards). In 2012, two Innovation Place buildings were officially awarded Level 4 certification, a level that only 2% of all buildings in Canada have achieved and the only two buildings in Saskatchewan to receive this top designation. Innovation Place has two out of only three LEED Gold certified buildings in Saskatchewan, awarded by the Canada Green Building Council. 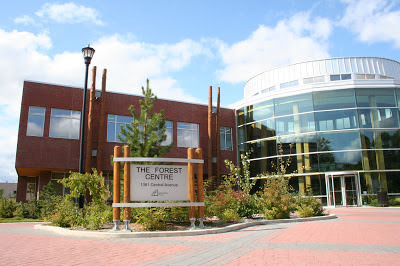 The Forest Centre building in Prince Albert was the first building in Saskatchewan to receive this designation in 2006.121 Research Drive in Saskatoon was awarded LEED Gold in 2012. The Institute of Public Administration of Canada (IPAC) awarded Innovation Place Silver in the 2008 IPAC Award for Innovative Management. The theme for the award was Managing the Green Workplace/ Innovations in Greening. Innovation Place was recognized for its integrated management approach that minimizes the environmental impact during building construction and reduces resource use during operation. They were also lauded for doing this while maintaining high satisfaction levels from tenants, contractors and employees. Innovation Place was named one of Canada's top 30 greenest employers by AON Hewitt, a ranking that is based on how employees perceive their employers’ environmental efforts. Innovation Place ranked 11 out of 280 eligible companies in Canada. As Gord says, sustainability is not a special initiative at Innovation Place – it’s part of the culture. More information about Innovation Place’s sustainability measures is available on their website.